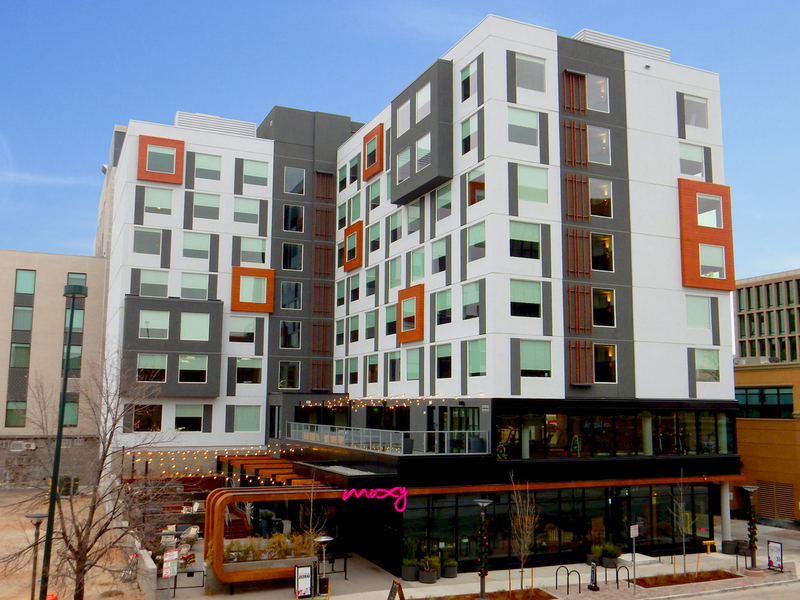 Moxy Hotel | Cary Kopczynski & Company, Inc.
Moxy Hotel is an eight-story hotel with 170 guest rooms and two levels of below-grade parking in the Cherry Creek North shopping district. The structure consists of seven levels of hybrid light gauge steel framing over a concrete podium and below-grade parking. CKC’s hybrid light gauge steel framing design provided a cost effective solution for the project. Hybrid light gauge steel framing is versatile. Unlike wood, this high quality system is fire resistant and free of vertical shrinkage. Using concrete filled steel deck with a dovetail rib configuration, spans are increased to twenty feet without floor joists. The floor-to-floor height is reduced with the elimination of all joists, which compresses the floor “sandwich” thickness to only 5” while still achieving the required two hour fire rating. The light gauge walls contain no strap bracing, “Sure Board,” or holdowns since all lateral loads are carried by CMU shear walls. This allows them to be easily prefabricated off-site.